North Dakota, although achieving statehood relatively late, has a rich history. Inhabited by Native Americans before the European fur trappers arrived, it was part of several U.S. territories before joining the Union. Its fertile soils attracted hundreds of thousands of immigrants that helped to shape its culture and history and lived through its booms and busts. Even though its population is relatively small, there are numerous records available to help research those who called the Peace Garden State home. 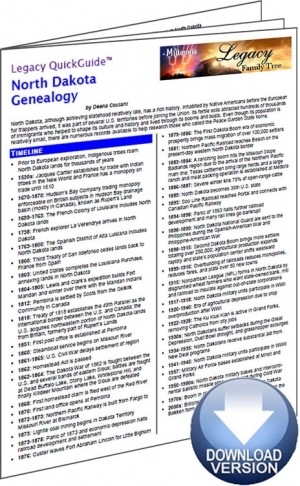 The North Dakota Genealogy Legacy QuickGuide™ contains valuable research strategy to help you find your Peace Garden State ancestors. This handy 13-page PDF guide can be used on your computer or mobile device for anytime access.